If you need an affordable laser hair removal machine, then you need to give strong consideration to the Palomar EsteLux system. This IPL model is one of the most affordable machines on the market, yet it can produce results that rival those from machines costing many times more. 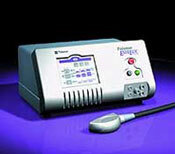 While this machine is primarily designed for hair removal, it can also treat acne and pigmented vascular lesions. Despite its affordable price tag and compact size of less than 50 pounds, the Palomar EsteLux is still a very fast laser hair removal system. It can treat an entire back or two legs in less than 30 minutes, and it can be used on virtually all skin types. To find out just how affordable a pre-owned Palomar EsteLux IPL machine can be, contact us right now for a no obligation price quote. Finding the lowest price on a used Palomar EsteLux IPL system is important, but so is finding cosmetic equipment that is reliable and will perform just as the manufacturer intended. At SunrayLaser.com, you can get all that and more. We sell high quality used cosmetic equipment at prices that are as much as 60% off the original retail cost, and we provide a full satisfaction guarantee. The Palomar EsteLux is incredibly affordable to own and operate, and at SunrayLaser.com we have pre-owned Palomar EsteLux laser systems for sale at the lowest possible price. Simply complete the contact form below for more information or a fast and free price quote.